I am inclined to say that I liked this book exceedingly well. At first, I must admit, I thought of maybe putting it down, and reading it later, or never. But I wanted to give the book a chance, since all books deserve at least a 2 chapter trial. Anyway, but the end of the first Act, I was completely hooked. In fact I read most of the book (about 300 pages) within one day. I thought the characters enchanting, but not perfect. They were very believable, and sincere. I think they were the highlight of the book. The plot was also very good, and kept you wanting to read more. All in all, it was a big hit in my opinion, and I highly recommend it. 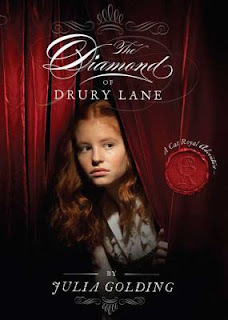 Cat is a streetwise orphan living in the Drury Lane Theatre in 1790s London. Her budding friendships with violin prodigy Pedro, a former slave; two teenage members of the aristocracy; and the theatre's mysterious new prompter are put to the test when she agrees to help safeguard the hidden treasure of the title. Golding's fast paced story abounds with atmosphere and adventure as Cat struggles to prevent the vicious leader of one of Covent Garden's street gangs from finding the diamond.